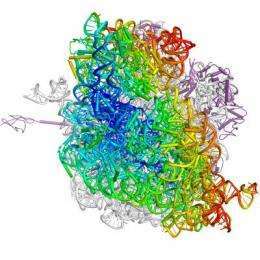 (PhysOrg.com) -- Researchers at the University of California, Berkeley, have for the first time captured elusive nanoscale movements of ribosomes at work, shedding light on how these cellular factories take in genetic instructions and amino acids to churn out proteins. Ribosomes, which number in the millions in a single human cell, have long been considered the "black boxes" in molecular biology. "We know what goes in and what comes out of ribosomes, but we're only beginning to learn about what is going on in between," said the study's principal investigator, Jamie Cate, UC Berkeley associate professor in chemistry and molecular and cell biology, and a faculty scientist at Lawrence Berkeley National Laboratory. The achievement, described in the Aug. 21 issue of the journal Science, could eventually lead to significant advances in the fight against human disease, the researchers said. They point out that many infectious diseases involve ribosomal warfare between humans and our bacterial or viral invaders. Important antibiotic drugs, like spectinomycin, capreomycin and aminoglycosides, exploit the structural differences between human and bacterial ribosomes to selectively attack the bacteria. Some viruses, like polio and hepatitis C, hijack human ribosomes, forcing them to pump out proteins that are beneficial for the viruses. "Inside the ribosome, antibiotics and viruses are using chemistry to either fight or promote disease," said Cate, who conducted the work with research specialist Wen Zhang and graduate student Jack Dunkle, both co-lead authors of the study, in his lab at UC Berkeley. "But what sort of chemistry? The short answer is that we have a lot still to learn. Once we find out, that knowledge could lead to more effective antibiotics, or new treatments against devastating diseases like hepatitis C."
In the protein manufacturing process, the genetic code - or instruction manual - for making proteins lies inside a cell's double-stranded DNA. When the cell needs to produce more proteins, the DNA unzips into two separate strands, exposing the protein code so it can be duplicated by single-stranded messenger RNA (mRNA). The mRNA dutifully delivers that code to the ribosome, which somehow reads the instructions, or "data tape," as each amino acid is added to a growing protein chain. At the same time, other RNA molecules, called transfer RNA (tRNA), bring to the ribosome amino acids, the raw building blocks needed for protein construction. To help elucidate the ribosome's movements as it interacts with mRNA and tRNA, the researchers used X-ray crystallography to obtain a highly detailed picture of the ribosome - a mere 21 nanometers wide - from an Escherichia coli bacterium. In addition to revealing atomic level detail, the technique allowed the researchers to capture the ribosome mid-action, a challenge because it acts fast, adding 20 new amino acids to a protein chain every second. "Scientists used to think that the ribosome made a simple two-stage ratcheting motion by rotating back and forth as it interacts with mRNA and tRNA," said Cate, who is also a member of the California Institute for Quantitative Biomedical Research (QB3) at UC Berkeley. "What we captured were images of the ribosome in intermediate stages between the rotations, showing that there are at least four steps in this ratcheting mechanism." "We suspect that the ribosome changes its conformation in so many steps to allow it to interact with relatively big tRNAs while keeping the two segments of the ribosome from flying apart," said Cate. "It's much more complicated than the simple ratcheting mechanism in a socket wrench." Cate said that while this study marked a major accomplishment in cracking open the "black box" of ribosomal function, there are far more details yet to be revealed. Advances in imaging techniques over the next decade should allow researchers to go beyond the snapshots taken in this study to high-resolution movies of a ribosome's movements, he said. "I'm looking forward to producing a movie of a ribosome with enough resolution and enough frames per millisecond that we can see what is happening at a molecular level," said Cate. "It would be great to watch and really understand how the ribosome makes a protein, how antibiotics interfere with a bacterial ribosome, or why a strand of genetic code in a hepatitis C virus is so effective at hijacking a human ribosome. We still have a long way to go, but we're working hard."